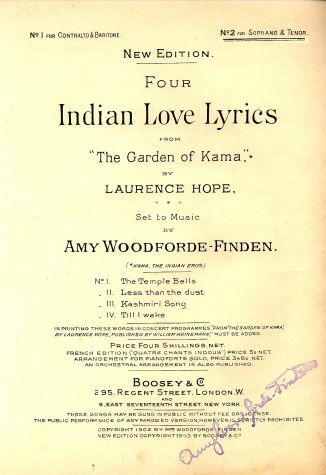 The Four Indian Love Lyrics, published in 1904, well illustrate the romance between Britain and all things Indian. These gloriously sensual songs contain a romance of their own. Amy Woodforde-Finden, wife of a brigadier in the Bengal Army was well known as a prolific composer of `eastern ditties,' which effectively captured the mood and morals of the period. Laurence Hope was less well known. 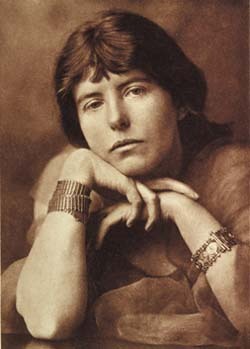 When "he" was discovered to be Adela Florence [Violet] Nicolson, the wife of an Indian Army General, quite a scandal ensued. Gossip suggested that the Kashmiri Song alluded to an affair between this lady and one of her servants. Her husband stood by her at that time. Tragically, however, he died in 1904 of complications following surgery, and, despite the efforts of her friends to care for her, his wife committed suicide a few months later. It is thought that the two women never met.